A diverse economy is a strong economy. Businesses that embrace our nation’s changing demographics reap the economic benefits of a diverse and inclusive workforce. Businesses that recruit from a diverse workforce are better able to find the best and the brightest talent needed to compete in an increasingly competitive economy. By bringing together our different backgrounds, skills, and experiences, businesses are better able to breed the type of innovative and creative solutions needed to succeed in an increasingly competitive economy. Businesses that embrace diversity also realize significant increases in workforce productivity and job performance. More broadly, a diverse workforce drives economic growth, as more women, racial and ethnic minorities, and gay and transgender individuals enter the workforce. In short, diversity is key to fostering a strong and inclusive economy that is built to last. This issue brief examines the state and strength of diversity in the U.S. workforce. Specifically, we look at the number and proportion of people of color, women, gay and transgender individuals, and people with disabilities in the workforce today. How diverse is the U.S. workforce? Before we examine the state of diversity in the workplace, let’s first examine statistics and broader trends in the labor market. In June 2012 approximately 155,163,000 people were in the labor force (those actively employed or seeking employment). With a total U.S. working-age population of approximately 243 million individuals, the labor force participation rate currently stands at 63.8 percent. Out of those 155 million individuals in the labor force, 142,415,000 are currently employed, with unemployment hovering around 8.2 percent. By 2020 the labor force is projected to reach more than 164 million people, a 5.9 percent increase from today. But economists project the labor force participation rate will drop over the coming decades, as an aging population of baby boomers exits the workforce. Most employed workers are in the private sector: 111,145,000 (83.51 percent) work in the private sector and 21,943,000 (16.49 percent) work in the public sector. Specifically, 10.58 percent work for municipal governments, 3.8 percent work for state governments, and 2.11 percent work for the federal government. Given the importance of diversity to our economy and to our society, let’s now turn to the economic data to better understand the state of diversity in today’s workforce. The U.S. workforce is undoubtedly becoming more diverse. As of June 2012 people of color made up 36 percent of the labor force. Breaking it down by race and ethnicity, approximately 99,945,000 (64 percent) in the labor force are non-Hispanic white; 24,679,000 (16 percent) are Hispanic; 18,758,000 (12 percent) are African American; and 8,202,000 (5 percent) are Asian. Approximately 4,801,000 people (3 percent) in the labor force do not identify in any of these racial or ethnic categories. The proportion of people of color participating in the workforce will only increase as the United States becomes a more racially and ethnically diverse country. Census data tell us that by 2050 there will be no racial or ethnic majority in our country. Further, between 2000 and 2050 new immigrants and their children will account for 83 percent of the growth in the working-age population. Within these communities, more Hispanic men and African American women (aged 20 and over) are in the labor force than Hispanic women and African American men. Of Hispanics in the labor force, 58 percent are men, and 42 percent are women. 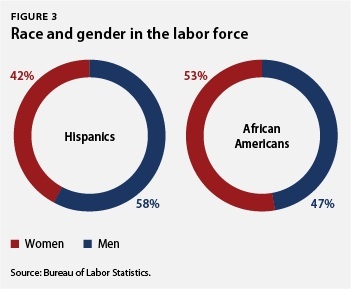 Of African Americans in the labor force, 53 percent are women, and 47 percent are men. Women’s labor force participation has grown dramatically over the past few decades. 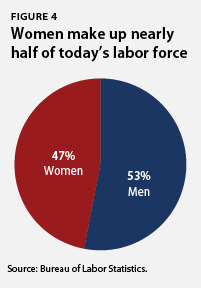 Currently women account for 47 percent of the labor force. In absolute numbers this means that approximately 72,713,000 women over age 16 are in the labor force today, compared to 82,450,000 men over age 16, who account for 53 percent of the labor force. This is a major increase from 1950, when women represented just 29.6 percent of the workforce. By 2020 the number of women in the workforce is expected to grow to 77,232,000, an increase of 6.2 percent from today. Moreover, by 2020 women’s participation rate in the labor force is expected to be greater than that of men. In terms of employment, the current unemployment rate for women is also lower than men’s—7.4 percent of women are unemployed, compared to 7.8 percent of men. 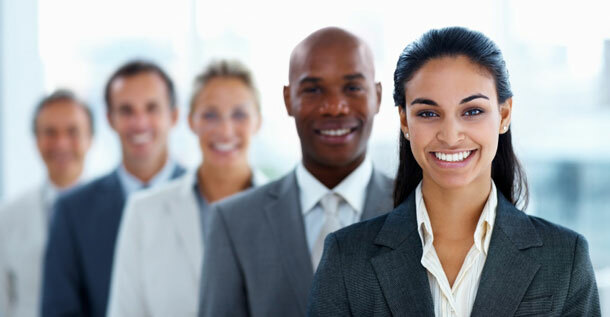 Women of color make up 33 percent of women in the workforce. Breaking it down by race and ethnicity, 67 percent of women in the workforce are non-Hispanic white, 13 percent are Hispanic, 13 percent are black, 5 percent are Asian, and 2 percent are other. Notably, these percentages are nearly identical to the working-age population of these subgroups. Sixty-six percent of working-age women are non-Hispanic white, 14 percent are Hispanic, 13 percent are black, 5 percent are Asian, and 2 percent are other. The United States is home to approximately 9 million gay and transgender adults. In absolute terms, researchers at the Williams Institute estimate that there are 585,000 gay or transgender workers in local government; 418,000 gay or transgender workers in state government; and 200,000 gay or transgender workers in the federal government. In other words, a little more than 1 million gay or transgender individuals work in the public sector. 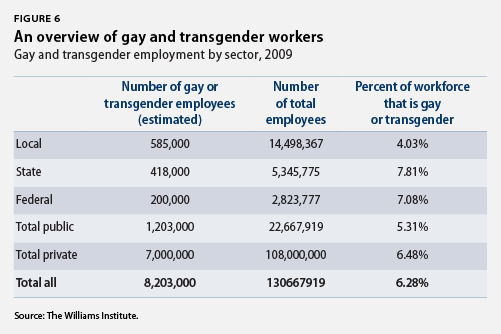 By contrast, approximately 7 million workers in the private sector are gay or transgender. According to the Williams Institute’s data, gay and transgender workers make up 6.28 percent of the workforce today. Moreover, gay and transgender workers have higher representation in the private sector—where they make up 6.48 percent of the workforce— than in the public sector, where they make up 5.31 percent of the workforce. It is worth noting that our understanding of the gay and transgender workforce is incomplete, given the lack of federal data on this population. Unlike race, ethnicity, gender, and other demographic characteristics, the Department of Labor does not collect information on workers’ sexual orientation and gender identity. The data included in this section are based off the Williams Institute’s estimation of Census data (rather than Bureau of Labor Statistics data). The federal government should enhance data collection initiatives by incorporating sexual orientation and gender identity into all federal surveys—including Department of Labor surveys. Doing so will provide us with a richer understanding of the gay and transgender workforce, including their racial and ethnic composition, their unemployment rates, and the gender breakdown. Because federal surveys do not adequately count the number of gay and transgender people in the population, we cannot accurately say where gay and transgender people are accurately represented and where they are not. People with disabilities are vital contributors to our economy, but the data tell us that our nation is underutilizing their talent. Approximately 27,382,000 Americans (11 percent) have a disability. Yet only 5,722,000 (21 percent) of these individuals are in the labor force. The unemployment rate of people with disabilities (disabled but looking for work) is 15 percent—much higher than that for people who are not disabled (8.7 percent). How diverse are our boardrooms and business owners? We unfortunately see a stark lack of diversity in corporate boardrooms. Looking specifically at Fortune 500 CEOs, only 21—a mere 4.2 percent—are people of color. 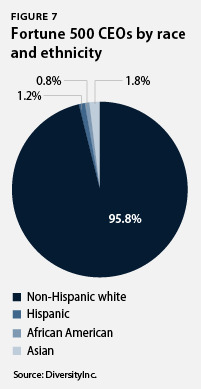 Four are black (0.8 percent); nine are Asian (1.8 percent); and six are Latino (1.2 percent). What’s more, only 4 are female people of color, representing just 0.8 percent of all Fortune 500 CEOs. 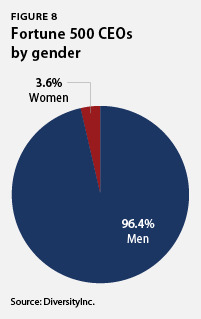 And while women make up nearly half of the labor force today, only 18 Fortune 500 CEOs (3.6 percent) are female. Diversity is not lacking, however, among our nation’s business owners. Strong diversity in business ownership has played a key role in advancing an economy that meets the needs of all consumers. According to the Census Bureau, people of color own 22.1 percent of all U.S. businesses. Moreover, women own more than a quarter of all businesses—28.8 percent. Gay and transgender individuals are also successful entrepreneurs. According to the National Gay and Lesbian Chamber of Commerce, gay or transgender individuals own approximately 1.4 million businesses. This means that approximately 5 percent of all businesses in the United States are owned by someone that is gay or transgender. The data outlined above reveal the strength and trajectory of diversity in the American workplace today. But diversity is sorely lacking in certain sectors and within certain industries of our economy. In nonprofits, for example, 82 percent of employees are white, and 18 percent are people of color (10 percent are African American; 5 percent are Hispanic; 3 percent are other; and 1 percent are Asian). This stands in stark contrast to the working-age population, where 64 percent are non-Hispanic white and 36 percent are people of color. 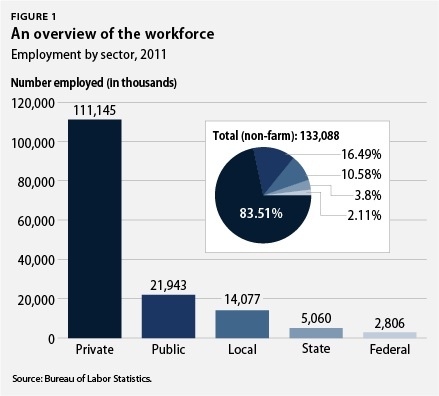 The federal government employs 2.8 million people and is the nation’s largest employer. But diversity is sorely lacking in senior levels of the federal government, as well. A CAP report from September 2011 highlights that the projected racial and gender makeup of the Senior Executive Service—the government’s top managerial, supervisory, and policy positions—will not be reflective of our workforce in 2030. Hispanics will be vastly underrepresented in the Senior Executive Service. In 2030 it is projected that Hispanics will make up 6.8 percent of senior federal employees, much less than the projected civilian labor force participation rate of 23 percent. Women will continue to be underrepresented in senior positions. Women are projected to be 41 percent of posts in 2030, compared to 47 percent of the projected workforce. These figures show that while our workforce and our country is becoming more diverse, many sectors of our economy have yet to keep up with our nation’s changing demographics. Diversity is one of our country’s core strengths. The economic data clearly show that our nation—and, by extension, our workforce—will continue to become increasingly more diverse, as racial and ethnic minorities make up a larger portion of the population, as women continue to enter the workforce, and as gay and transgender individuals, as well as people with disabilities, continue to play a vital role in growing our economy. Going forward, businesses should continue to capitalize and embrace diversity as the workforce itself becomes more diverse. Our economy and our society depend on it. Crosby Burns is a Research Associate and Kimberly Barton is an intern for the LGBT Research and Communications Project. Sophia Kerby is a Special Assistant for Progress 2050. Thank you to Progress 2050 intern Jordan Rogers for his research on this brief.